Employment opportunities in Utah for Certified Nursing Assistants (CNA) are excellent due to the increase in the state’s aging population. The Utah Nursing Assistant Registry (UNAR) is the state agency that oversees the state Certified Nursing Assistant process. The agency approves CNA training programs, monitors test sites, maintains the UNAR, certifies nursing assistants who meet CNA certification requirements and processes certification renewals. Utah has developed a clear and efficient process for becoming a CNA. In the following sections, the certification process is reviewed step-by-step. There are steps that individuals should take to become a CNA in Utah. Following is a description of the basic steps, beginning with choosing the right path to certification to renewing certification. Utah offers several paths to nurse aide certification, so the first step is reviewing each option. Certification requirements for a new nurse aide require completing a state-approved CNA program and taking and passing a state competency evaluation exam. There are other paths for individuals who meet certain requirements. Nursing students who can provide a transcript showing they successfully completed and passed a fundamentals of nursing class within the last two years can become a CNA by passing the Utah state exam for nursing assistant certification. Any nursing students who do not pass the state exam within three attempts will have to complete a CNA training program. Here is the application form for certification testing waiver. If a nurse from any state has an expired license but is in good standing with that state’s nursing board, a training waiver can be requested. The individual will have to take the state exam and pass within one attempt. Otherwise, the individual will have to train and retest. Out of state nursing assistants can apply for certification by reciprocity in Utah if their certification in the other state is active and unencumbered. If the out of state certification is expired, the individual must complete a state-approved training program in Utah and take the state exam. 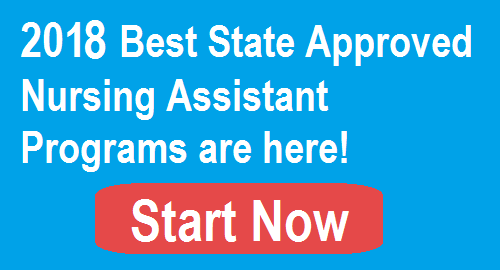 For those who must complete a training program and/or take the state competency exam, the remaining steps apply. Utah state law requires a CNA training program to consist of a minimum of 100 hours of educations. The 100 training hours includes 24 hours of clinical training in a long-term facility. There are 55 CNA programs in Utah offered at a variety of educational facilities that include colleges, technology colleges, academies, allied health schools, universities, hospitals, nursing homes and rehabilitation facilities. There are also a number of CNA training programs offered only to high school students. The program data is updated in November 2017. Kaysville Davis Applied Technology College C.N.A. Federal and state laws allow individuals to work in Medicare/Medicaid funded nursing homes and other long-term care facilities while employed. The law requires earning certification as a nursing assistant within 120 days. The law also requires their employer to cover training costs, so this is one way to get free training. Another way to get free training is to find employment within 12 months of becoming a CNA at a Medicare/Medicaid funded nursing facility. The employer will reimburse the student for training costs. The CNA must work at least three months at the facility and an average of 20 hours per week to qualify for reimbursement. The costs of training include program tuition and fees, uniforms, textbooks, medical supplies and test fees. A program charges tuition, but that may or may not include items like uniforms and textbooks. For example, the Allied Health Care Certifications Center charges $400 (subject to change) for a month-long program. It includes tuition, textbook, clinical instruction and CNA exam preparation. The student also pays additional amounts for the testing fee, supplies and uniforms. The Salt Lake Community College’s 150-hour daytime CNA training program takes approximately one semester to complete and costs an estimated $540 (subject to change). The amount includes an application fee, tuition, student fees, lab fees and books and supplies. Students will still need to buy scrubs. Financial aid may be available to students through workforce training funds, scholarships and grants. It is important to meet with financial aid staff at the school to explore funding opportunities. Each school and program in Utah can add additional requirements beyond the minimum prerequisites. For example, a school may require the student to get a minimum score on English and math basic skills assessment tests or to turn 18 years old by the time they are expected to take the competency exam. While attending CNA classes in Utah, students master the knowledge and skills typically needed to provide high quality services to residents and patients. The program also prepares the student to take the Utah state certification or competency evaluation exam. Taking and recording vital signs, i.e. blood pressure, respiratory rate, pulse, temperature, etc. Measure and record fluids, i.e. fluid intake, urine output, etc. Only the CNA training course instructor can provide exam applications to nursing assistant students. The exam application is sent to the UNAR with testing fees. Once fees are paid, the applicant can schedule a test date online through Testmaster Universe within one year of completing training. The state certification exam consists of two parts. This part of the Utah CNA exam requires the ability to successfully complete five randomly selected skills, utilize proper handwashing skills, measure and record a set of vital signs and verbalize beginning and ending procedures. The written exam has 100 multiple-choice questions. Individuals must get a minimum score of 75 percent for passing. Here is one sample test that give a good idea of the type of questions asked. Test sites are located around the state at universities, colleges, technical colleges and community colleges. Utah administers its own CNA tests. Individuals are allowed three attempts to pass both parts of the state exam. The names of candidates who pass the state CNA exam are placed on the Utah Nursing Assistant Registry (UNAR). The testing site will submit the names to the UNAR after candidates successfully passes the competency exam. CNA certification in Utah is valid for two years. To maintain an active certification, a licensed nurse (LPN or RN) must provide verification the Certified Nursing Assistant worked at least 200 paid hours in nursing or in performing nursing related duties while under the supervision of a licensed nurse. If a nursing assistant cannot meet the 200-hour work requirement, he or she gets one attempt to take and pass the state CNA exam. If an individual worked for an employer who does not have a licensed nurse to verify the 200 hours, the CNA will have to retest within 12 months of the expiration date of certification before certification renewal is allowed. If a certification is lapsed (expired) for less than six months, the nursing assistant can follow the same renewal process as a person with an unexpired certification. If the certification is expired for more than six months but less than 12 months, the nursing assistant must retake the competency evaluation exam to renew certification. If the certification has been expired for more than 12 months, the nursing assistant must retrain and retest.